We were blessed with a clear sunny day for our last dive trip of March. We departed San Pedro Harbor aboard the Bottom Scratcher bright and early, and headed to the front side of Catalina Island. The first dive was at Indian Rock, a large rock off of Emerald Bay on the west end of the island. We were anchored to the west of the rock, in about 30 feet of water. We had nice visibility, and we could see the bright orange garibaldi swimming under us as we jumped in. As we swam around the boat we could see small aggregates of blacksmiths hanging out in the kelp forest. We moved westward along the island to Doctor’s Cove for our second dive. The boat was sitting over sandy bottom area with reef extending from just off the boat toward the island. 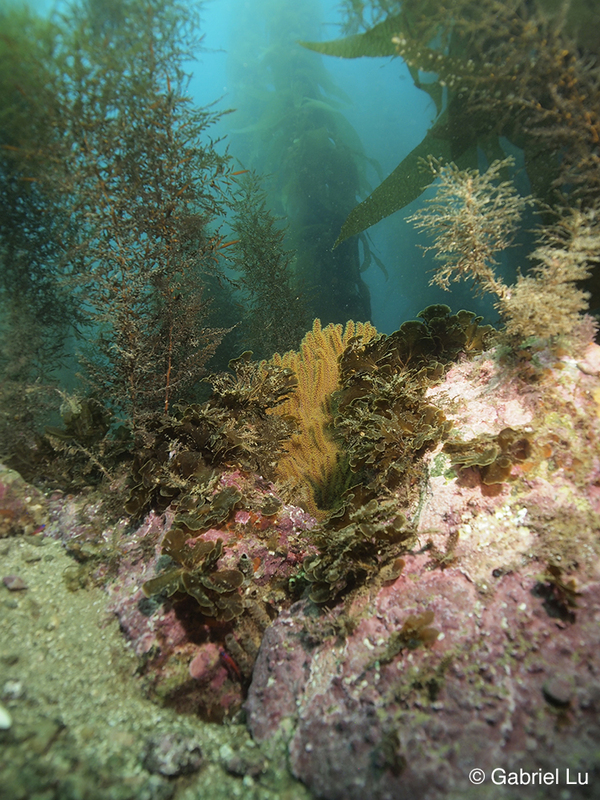 There were some giant kelp beds, and the reef was covered with various types of seaweed. There were many juvenile kelp bass hiding among the seaweed. While I was combing through the seaweed, I spotted many blue-banded gobies and a crevice kelpfish. In the sandy areas between the rocks there were some tube dwelling anemones. On the way back to the boat we swam past some aggregating blacksmiths. For the last dive of the day, we headed back eastward past the Indian Rock, and set anchor at Howland’s Head. As we descended to the reef we spotted more garibaldi and sheephead, and juvenile kelp bass. There were several red abalones around the bottom areas of the reef rocks. I picked up a piece of kelp, held it in front of it and watched it eat it. We enjoyed swimming through the luscious kelp beds and made our way back to the boat. It was such a nice day for a dive trip. Warm, sunny day out on the water with nice visibility. As we watched Catalina get smaller and smaller in our view, we talked about what we saw on our dives. It almost felt like we were back at the harbor too quickly. Please Note: This is a printout of the Ocean Safari Scuba | Blog | Dive Trip Report 3/31/19 – by Megumi Itoh page from 04/22/2019. Some information may have been updated in the mean time. Please visit PAGE URL to view the latest up-to-date information or call us at 626-287-6283 if you have any questions.